Facebook is to settle a class-action lawsuit in California that accused it of appropriating its users' likenesses for its Sponsored Stories advertising feature, according to a court document filed Tuesday. Sponsored Stories highlight brands that a user's social contacts have "liked." If a Facebook user likes Levi's brand page, for example, her friends may see an advertisement accompanied by text that says, "Jane likes Levi's." When Facebook introduced the feature in 2011, it showed the user's profile photo alongside their endorsement. The lawsuit, filed in the Northern District of California, said that was a violation of California state law, because Facebook didn't give users the chance to opt out of having their image used. Terms of the settlement haven't been disclosed yet, but Facebook has reached a deal "in principle" to settle the suit, according to the filing. The suit was filed by Angel Fraley and two other named plaintiffs on behalf of other, "similarly situated" users. The complaint points to a statement on Facebook's website that read, "While there is no way of opting out of seeing all or being featured in any Sponsored Stories, [users] can remove specific stories by clicking the 'X' displayed in the upper right side..."
An edited version of the statement still appears on the website. One legal issue in the case was whether Facebook could be said to have authored the statements that informed users that the plaintiffs had "liked" a particular brand. The plaintiffs' attorneys did not respond to a request for comment Tuesday. Both Facebook and its lawyers declined to comment. 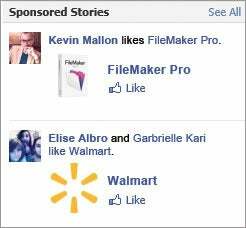 Sponsored Stories began as a desktop feature. In March, the company began delivering Sponsored Stories in mobile users' news feeds, the first advertising to come to Facebook's mobile app.